Upon its 25th anniversary the American car manufacturer, Panoz celebrated it by unveiling its new model Panoz Esperante Spyder 2015. Esperante with very first look holds the power to steal your attention for coming more minutes and will undoubtedly force you to go for a long furious ride. Let us have a closer look at what Panoz thinks can best treat its buyers upon its 25th anniversary celebration model. 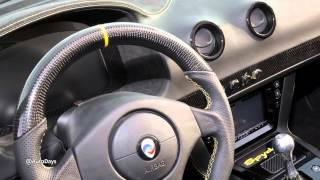 The interior of Panoz Esperante Spyder 2015 comes with lot of space in its interior. Starting from the door panels, to dashboard and till the seats, everything is now covered in high quality leather with notable carbon-fiber inserts in cabin with an option to go for Alcantara inserts. Seats are prepared with racing specs; let that be then the bolstering, carbon fiber shells or the four point harness accompanied by competition lock-out switches. Taking a lap ahead from quality and comfort, the infotainment segment gets adored with an all 10.6 inch digital instrument display replacing the predecessor gauge-cluster unit. The steering wheel is wrapped in leather with controls for the same instrument cluster and thus driver can surf through available options without losing command over Esperante Spyder 2015. In the same segment also comes a seven inch infotainment screen mounted over center console featuring navigation, DVD player and satellite radio connectivity. 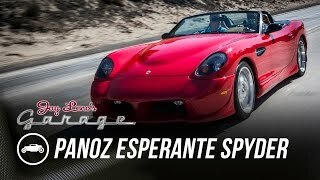 The exterior of Panoz Esperante Spyder 2015 at first glance might look similar to the its predecessor 2000 year model but second look will keep you stuck over the redesigned bumper and carrying new set of headlamps above it. Same changes could be notice round the back. Main thing to be noticed here is use of lightweight super formed in making the body of Esperante Spyder 2015. In all the low slung profile of car is highly attractive and use of lightweight materials brings expectations of it being a performance oriented release upon company’s 25th anniversary celebration year. 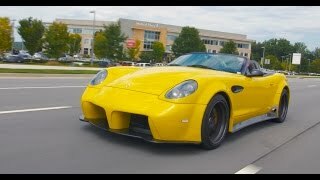 The Panoz Esperante Spyder 2015 in context to its power comes with two engine options; first in queue is the 5.0 Liter V8 engine producing 430 horsepower while the second is 5.4 Liter eight-banger enthralling 560 horsepower. Both these engines will be paired to Tremec T56 Magnum six-speed manual transmission with an option to switch for six-speed automatic with paddle shifters. Thus with these shared specifications Esperante Spyder 2015 is capable of reaching a top track speed of 172 mph while the 0-60 mph sprint might take 3.7 seconds (estimated).